People always have love for all things classic: classic rock, classic cars, and the classic leather motorcycle jacket. With its no-frills vintage design, the new Dainese Archivio D1 Leather Jacket captures the essence of what makes the motorcycle jacket a classic. The original Dainese Archivio Leather Jacket launched in the spring of 2014. Dainese will be releasing their D1 version in spring of 2017. There are no significant changes to the DNA of the jacket for 2017. It will perform best in the Fall and Spring as the outside is still a distressed piece-dyed cowhide leather with a cotton lining. Dainese has chosen to continue to use Pro-Shape CE-certified removable soft protection in the jacket to keep a low-profile. The jacket comes with Pro-Shape armor in the shoulders and elbows with a back protector pocket for Dainese’s G1 and G2 back protector (sold separately). 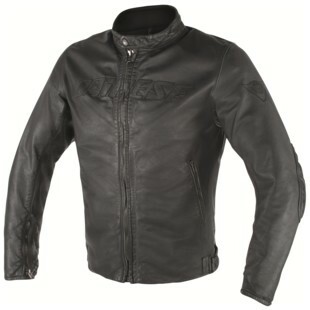 This jacket is ideal for the rider who is looking for a premium vintage leather jacket for cool weather riding. The Archivio D1 Jacket is an old school jacket with some new school reinforcements. So for those riders who like to keep it classic, the Dainese Archivio D1 Leather jacket is bound to impress. Tags: Archivio D1 Leather Jacket, Archivio D1 Leather Motorcycle Jacket, Dainese Archivio D1 Leather Jacket, Dainese Archivio D1 Leather Motorcycle Jacket.